The Hamilton Avenue Ferry ran between Red Hook, Brooklyn and Manhattan for nearly 100 years. Two major reasons it stopped: drop in ridership and alternative means of transportation. 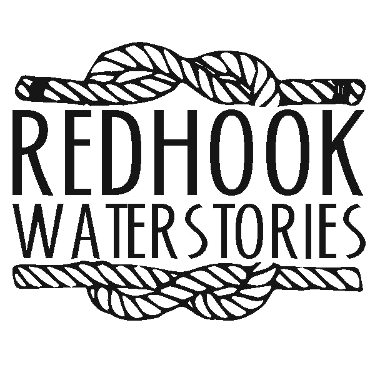 In 1846 when Hamilton Avenue Ferry service to Manhattan started it was the only mass transit option to and from Red Hook, Brooklyn. This was no longer the case in 1914, street cars and elevated subway lines crossed the Brooklyn Bridge, and the Ferry, once one of the most popular in the city, was seeing a significant drop in ridership. Merchants in the area said that the drop in ridership was hurting their business and blamed the ferry’s 5 cent charge. They argued that if the price was dropped back to 3 cents, more people would take it, and everyone would be better off. Unfortunately for the merchants, ridership continued to decline. 3,404,108 passengers took the Hamilton Avenue ferry in 1923 but by 1927 the number was 2.564,977 passengers and 114,879 vehicles. In 1930 that number had further decreased to 1,738,142 passengers and 61,603 vehicles. 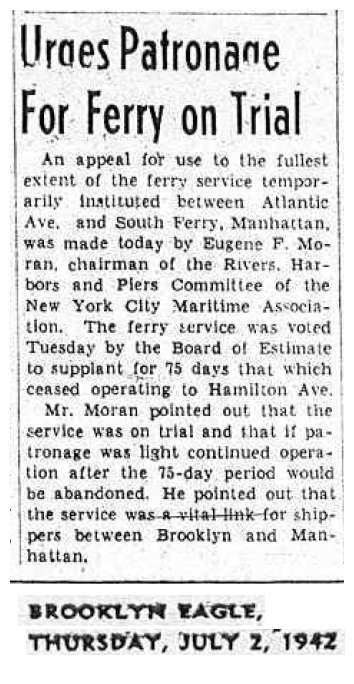 Commissioner Goldman of NYC’s Department of Plant and Structures called for the abandonment of the Hamilton Avenue Ferry line in 1932. New York City began running the Hamilton Avenue Ferry as a public service in 1922, taking over its operation from the Union Ferry Company. Ten years on, the system was running at a growing deficit and major renovations were needed. "The terminal building and ferry slips at the Brooklyn terminal of the Hamilton avenue ferry are in such poor condition as to require complete reconstruction. It is estimated, that the sum of $250,000 would be required for reconstruction purposes,” Goldman reported. The Ferry was slated to close May 30, 1938 but got a reprieve. 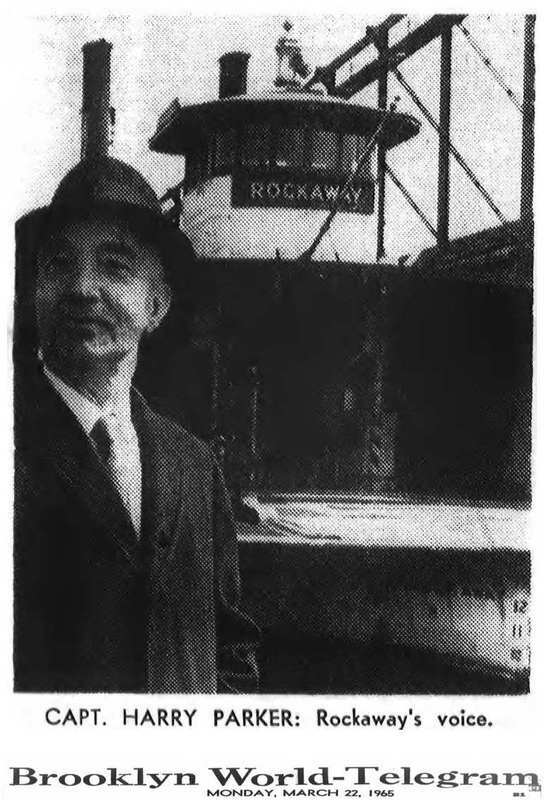 Championing the ferry, Brooklyn Borough President Raymond Ingersoll stressed its importance in transporting building materials to the Red Hook housing development (NYCHA) then being built. He pointed out that it was the lone remaining water connection between South Brooklyn and Manhattan. 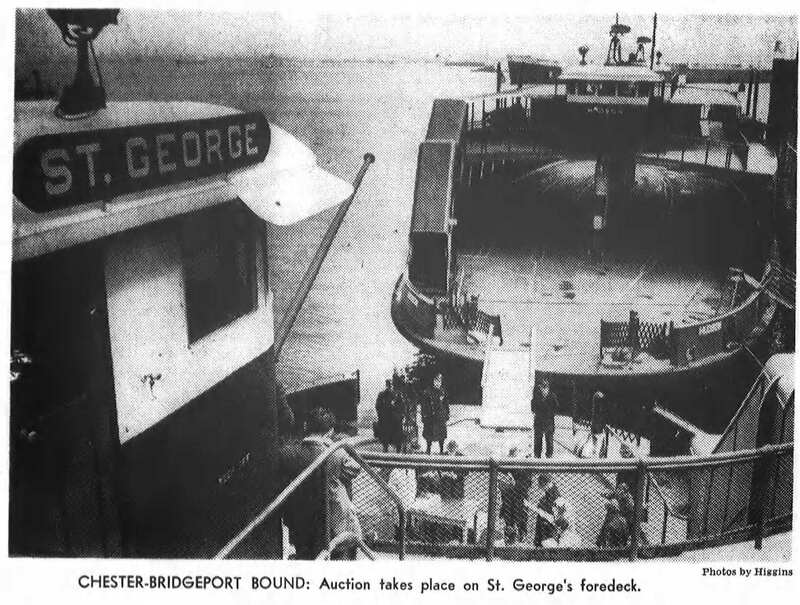 "I am sure," Ingersoll said, "that the use of this ferry will continue to grow, providing as it does a direct water route between important business sections of Manhattan and Brooklyn, and that eventually permanent operation will be shown to be warranted." Ingersoll’s predictions were wrong, fewer and fewer people were taking the ferry and City officials got tired of footing the bill. In the end it was another building project, the Brooklyn-Battery Tunnel, which brought about the final demise of the Hamilton Avenue Ferry in June of 1942. Construction of the tunnel interfered with access to the ferry terminal in Red Hook. 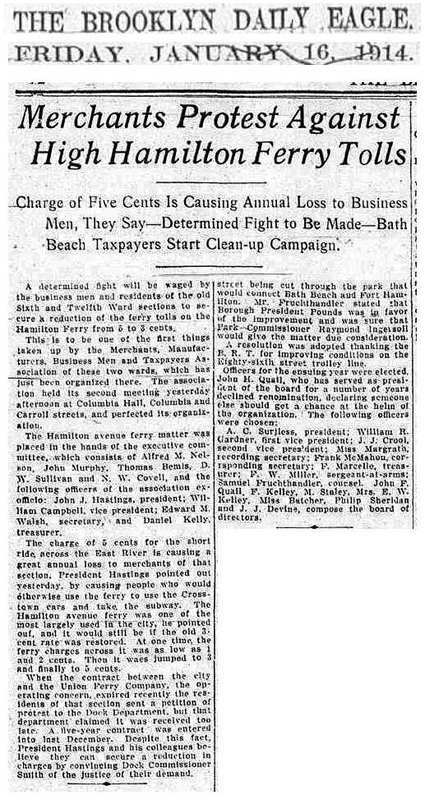 A temporary ferry service leaving from Atlantic Avenue, about 15 blocks away, was established but it barely lasted two months before operating losses greater than the City had budgeted for, led to its shut down. The old Hamilton Avenue Ferry Terminal stood abandoned until 1956. It was razed that year as part of a major redevelopment of the area: a new shipping terminal the City hoped would be better suited for the coming years. 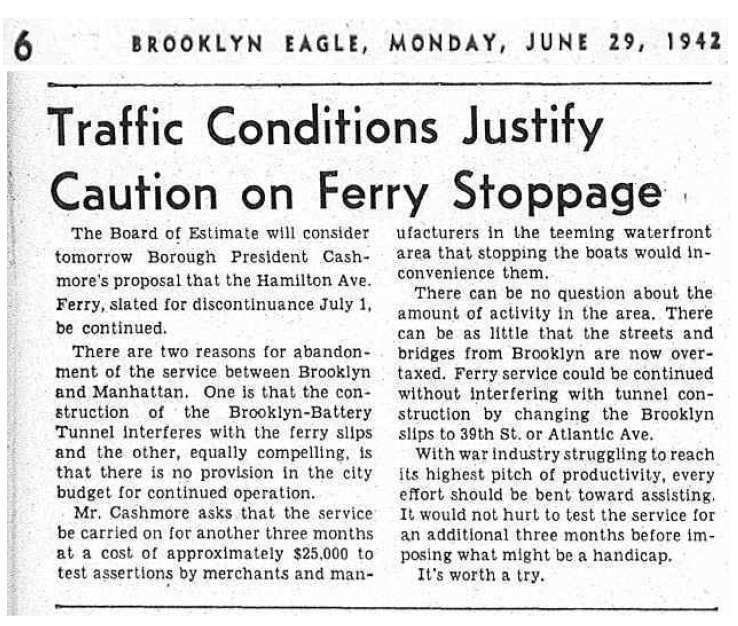 The last of two ferries that ran the historic Hamilton Avenue Ferry line were sold by New York City in 1965. The ROCKAWAY was built in 1925, at Todd Shipyard in Erie Basin, just around the Red Hook peninsula from the ferry terminal. The ASTORIA was built the same year in Staten Island to the same specifications. Both, according to Capt. Harry Parker, supervising captain of New York City's ferry fleet in 1965, were “the first oil-burning propeller-type steamers, designed to replace the old coal-burning steamboats that trace back to Robert Fulton's original steam ferry on the Fulton St. line." 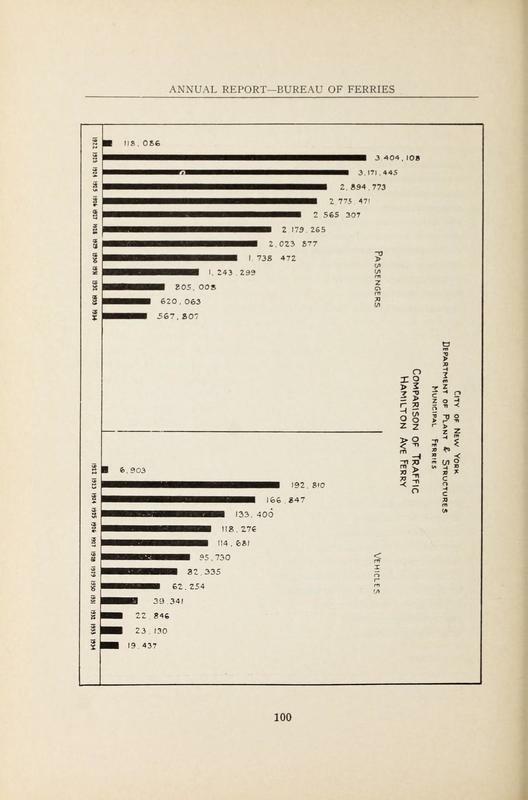 Office of the Board of Engineers for Rivers and Harbors, Annual Report of the Chief of Engineers, 1944 Part 2: Commercial Statistics, Water-Borne Commerce of the United States or the Calendar Year 1943. Washington, Government Printing Office, 1945. “Old Ferry Terminal Doomed in Brooklyn,” The New York Times, September 20, 1956.